OOTD - I Love Fall | La Petite Noob | A Toronto-Based Fashion and Lifestyle Blog. The lipstick that I'm wearing is actually a mix of two shades - Mac's Pleasure bomb from the Rihanna collaboration, and Mac's Rebel. The result is the perfect shade of bright plum that I just can't seem to replicate in a single lipstick tube. Does anyone know of a shade that is similar? 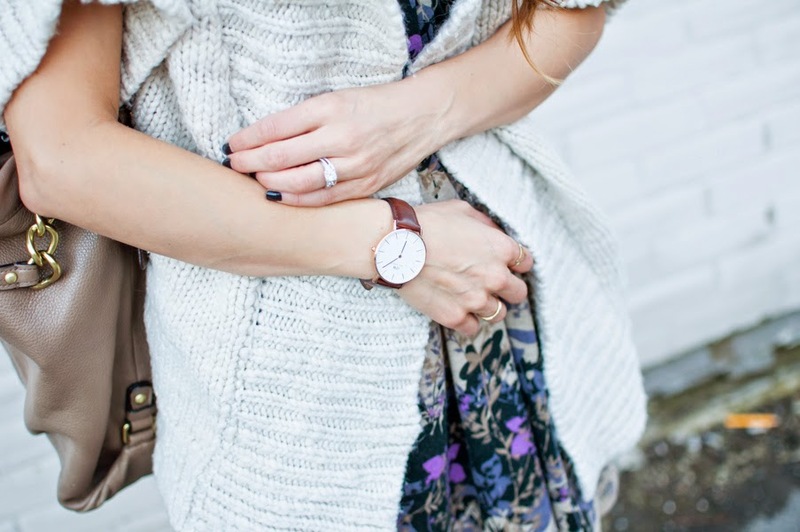 Remember - there's still time to get 15% off of your Daniel Wellington order by using the coupon code "lapetitenoob." I still wear my Daniel Wellington Classic St. Andrew's Lady watch everyday, and absolutely love the richness it adds to my outfits. What do you think of my Fall outfit, from older items I found while cleaning up my closet? Do you also have luck shopping your own closet? Let me know! Same here - my wardrobe is pretty modest by most standards, but I still always manage to find clothing that I had forgotten I had during a closet clean up! You look gorgeous! I love the hat and those booties! Have a great weekend! Thank you Alecia, I hope you have a great weekend as well! you always make hats look so amazing! Thanks Lena! Truth be told, I wear them so much because I'm the laziest person for going to the hair salon - instant root coverup! Love this look! That hat is perfect! Thanks Courtney, I'm glad that you like it! Yes, this hat if definitely my favourite and goes with almost every outfit! Love this cozy looking cardigan!! Thanks Cassandra, I do too - so glad that I rediscovered it in my closet! HAHA that's awesome - I wish! The ladies at Pantene would take one look at my split-end riddled mop and send me packing!